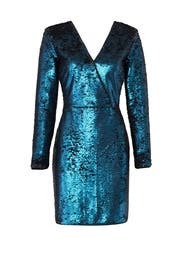 Scales of metallic sequins glisten over every curve created by the flattering wrap silhouette of this retro-glam dress by Adelyn Rae. An unexpected open back ups the ante. Blue sequins on mesh (100% Nylon). Hourglass. Long sleeves. V-neckline. Exposed back button and hidden front button closure. Fully lined. 35" from shoulder to hemline. Imported. The photo is from when I tried it on, I ended up wearing it with black tights and heels. The open back was a great touch, but the sizing did require a backless bra. There is not a lot of stretch, but it has a little. People really like to tiich your sequins! This was actually very comfortable. I usually wear an 8, and the medium was great. I was a bit concerned as I have large shoulders and arms, but there was plenty of room. From the picture you can not see that when down the sequins are teal, but when they get flipped up they are black. I had everyone at the party petting my dress!! If you want to feel extra fabulous and stand out, this is the dress for you. 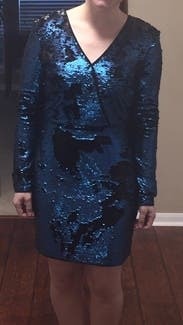 Wore it on New Years Eve and not only felt like a party, I was the only person wearing a bright color. So fun! A little short, but that's part of this dress' flirty charm. Night my three-year-old like the fact that he could go up for black and down for blue. It was a fun dress a room it reminded me of something I would see at the space theater. I liked it so much I bought one for my mom. I didn't end up wearing this to the event, I wore a backup style. The shoulders are padded and if you have a small frame, it can make you appear wider and bigger than you are. It didn't fit my frame well. I'm 5'1 and 110 lbs. I Didn't Want To Send This Back - LOVED IT! I can't provide enough positive feedback to express how much I loved this dress! I rented it for a NYE dinner/party and loved it the moment I took it out of the bag. Then when I put it on - omg. It's such a unique dress that I know, if I saw it in the store, I'd love it but wouldn't buy it because I would only wear it once. Everything about the dress was amazing - fit, color, style, etc. Plus, I got an insane amount of compliments while wearing it and even on social media after I posted a pic of it. Would definitely rent again for a sparkly occasion! Wore this on XMAS eve when I was in Las Vegas. fit was great except a tad bit big in the back. I am a size 4 my bust is a 34D so for me it really complimented my shape and made me look trim around the tummy area! Who doesn't love that? This is such a great dress for going out! 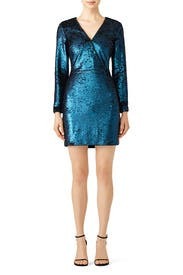 Running true to size, I recommend sizing up for the backup size due to the sequins. There's comfortable room at the bust and this is great for any cup size, however due to the cut out in the back, I do suggest wearing a NuBra or no bra with this dress. The sleeves are not too tight and there is comfortable room in the midsection and hip areas. 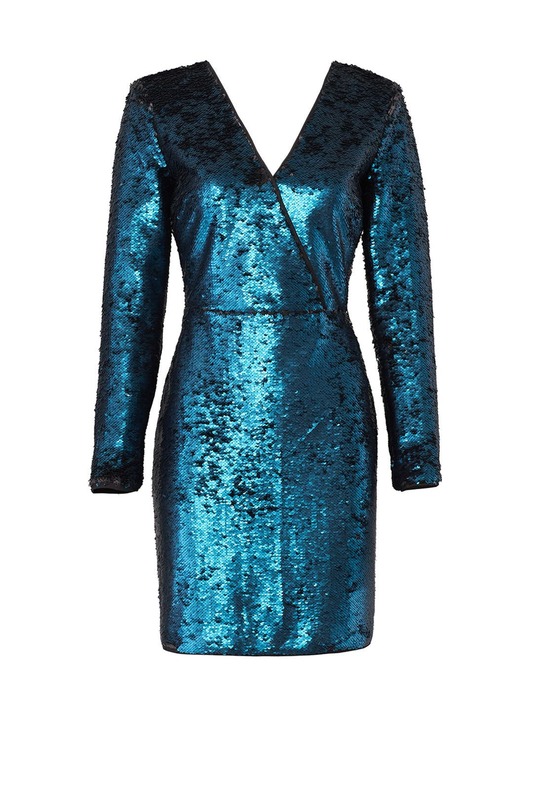 The sequins and the open back make this the perfect dress for going to a club! At 5'4", this dress hits me at my knees. Pair with no jewelry and black shoes to complete the look!